Today was a perfect balance of work and play. I cleaned, did the laundry and caught up with the administration of our IT-company. And at the end of the day we had a nice meal on the roof, splashed around in the swimmingpool for an hour and basked in the sun to dry up. But I don’t have any pictures of that. know these are not the most beautiful colors one can think of, but I’m still finishing my stash, and making the best of it. I’m trying to see it as a challenge: making this pile of tangles (that’s how I bought it March 2007) into a pile of finished objects. 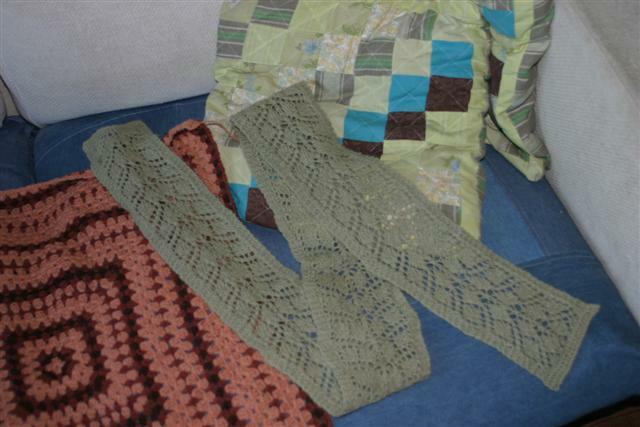 The green of the scarf is acceptable (a little greener than in the picture) and the blanket is getting enough contrast with the browns (I’m not a fan of the pinkish ecru stuff).